I did not manage to take any spectacular photographs this year. I did take some photos, but none of them are great, somehow there just wasn't much opportunity this year. I usually shot a lot of pics during the Baroque show but that was indoors this year so I didn't take any of those. There seemed to be fewer horses this year, and some breeds that normally have a strong representation were missing. Huh. 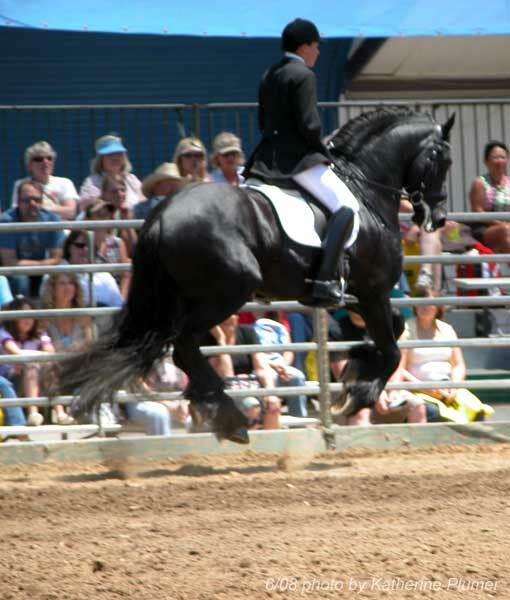 Here's a photo of a flying Friesian though. The art show was interesting. There was some incredible art, and there was some incredibly bad art. Like, to the extent that I really have to think they must be low on entries. 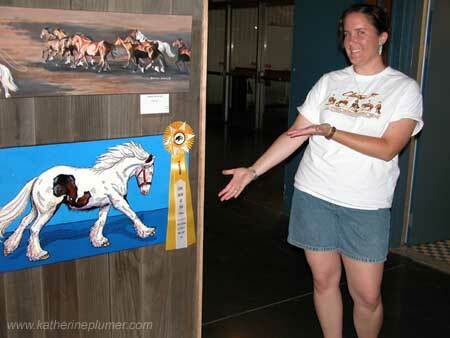 Draft Horse Classic is a FAR better showing of equine art. Sounded like not much sold this weekend. My painting did not sell, but it did place third in the acrylic division. I can't say I agree with some of the placings, but who am I to judge. So Saturday I spent the day at Horse Expo with BK, which was super fun, and it was actually kind of neat to be there two days because I saw totally different things on different days. Saturday we saw lots of clinics and educational stuff, and it's downright fascinating to me to listen to different trainers talk about accomplishing the same goal. Some of them use basically the same techniques but have different terminology or explain them in somewhat different ways. Others completely contradict each other. So whereas one person talks about moving a horse with leg pressure, and being able to move different parts of the horse depending on the position of the leg, the next trainer comes along and says legs are only for getting the horse to move forward, and other than that need not move, and you can move the horse anywhere you want to go entirely with the reins. Huh? I have to say that clinic confused me, I can sit there and watch the results but I don't understand HOW it's accomplished. Or why they are so different.